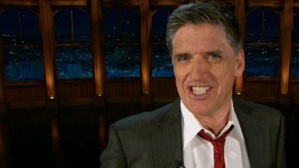 Stephen Colbert & Craig Ferguson are capping their shows this week. Their departures this week won’t be rattling the late night terrain like David Letterman’s recently announced May 20th exit after 32 years on NBC and then CBS. Not that there won’t be some tremors. Letterman’s successor, Stephen Colbert, will sign off Comedy Central’s The Colbert Report on Thursday, Dec. 18th after a nine-year run. His scheduled last guest is The Grim Reaper, who will come to claim Colbert’s conservative blowhard amalgam of Bill O’Reilly, Rush Limbaugh and Sean Hannity. Ferguson, whose Late Late Show has followed Letterman’s Late Show since January 2005, has booked Jay Leno as his closing guest on Friday, Dec. 19th. There’s a guy who knows something about stepping down. Other puzzle parts are in place, but not all of them just yet. Colbert’s replacement is scheduled to debut his The Nightly Show with Larry Wilmore (formerly The Minority Report), in January 2015 on a still undisclosed date. Ferguson’s heir will fire up Late Late Show with James Corden on March 23rd. During the interim, CBS has booked a passing parade of guest hosts, including Drew Carey, Wayne Brady, Will Arnett, Judd Apatow and John Mayer. CBS hasn’t yet decided what to do during the interim between Letterman’s goodbye and Colbert’s arrival. The latter’s start date remains up in the air and possibly won’t be until September of next year, according to some published reports. Ferguson, who played a recurring character on ABC’s The Drew Carey Show, came out of nowhere to get the Late Late Show desk job. CBS had staged on-air auditions for several other better known applicants, ranging from D.L. Hughley to Ana Gasteyer to Tom Arnold. Ferguson’s pronounced Scottish accent also seemed to make him a longshot, but he eventually won the network over with a blend of enthusiasm and derring-do. Ferguson, who in recent weeks has also been hosting the recently launched, decidedly lame quiz show Celebrity Name Game, became known for his freewheeling, mostly unscripted monologues and a remote-controlled skeleton sidekick known as Geoff Peterson. His ratings were decent although never dominant. But Ferguson nonetheless had a rumpled, Everyman appeal, whether going off on tangents or striding to within inches of the camera to almost jet propel himself into living rooms. Perhaps he paused to laugh at himself more than necessary. Still, Ferguson’s hard-core fans pledged allegiance to his every whim. No one could accuse him of being derivative of anyone else in late night, before or current. At his best he was simply brilliant. 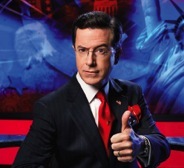 Colbert amazingly kept his cocksure character fresh and percolating throughout the run of his show. Imagine Martin Short being Ed Grimley for nine years running. Or Dana Carvey always interviewing guests as the scolding Church Lady. It was an impossible task that Colbert made possible. Perhaps he longed to quit the charade. But he didn’t, making The Colbert Report a signature and very likely never to be duplicated half-hour of superb performance art. He’ll drop the character and finally become himself again on CBS’ Late Show. And Colbert will have his work cut out for him opposite NBC’s The Tonight Show Starring Jimmy Fallon and ABC’s Jimmy Kimmel Live!. Colbert will bring a younger sensibility than Letterman has in his autumn years. But what will his niche be? Are late night viewers in the mood anymore for serious conversation? Or might too many of them dismiss Colbert as a bespectacled egghead in comparison to the still very boyish and bouncy Fallon? For now, though, we salute two more distinguished keepers of the late night flame. Craig Ferguson and Stephen Colbert were decidedly and bracingly different within the realms of Late Late Show and The Colbert Report. They had the temerity and the skill-sets to do it their ways. And the longevity to leave some lasting late night imprints that will stand the tests of time.